VisibilityOne's patents demonstrate and validate our ongoing ability to develop leading-edge technologies for UC&C. VisibilityOne Corp, the Los Angeles based startup developing the next generation monitoring solution for the Unified Communications (UC) industry, today announced that it has been awarded a second patent by the US Patent and Trademark Office for innovations in its approach to monitoring video conferencing equipment. VisibilityOne provides enterprises the ability to monitor and manage their entire unified communications and collaboration (UC&C) infrastructure, including video devices, audio headsets, and cloud meeting solutions from one view. U.S. Patent 9,955,151, describes a method to continuously monitor and diagnose the health of the unified communication and collaboration network and devices using vendor-agnostic diagnostic hardware/software. VisibilityOne replaces siloed monitoring tools with a single view that provides real-time performance and actionable insights into devices, applications and the operating environment. 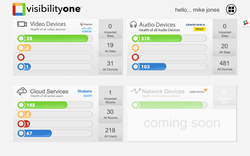 VisibilityOne helps monitor and manage all voice and video on the UCC network, including device usage, firmware updates, real-time status and notifications allowing IT teams to anticipate and resolve device issues before users are impacted. "VisibilityOne's patents reinforce and protect our innovations," said Jose De La Paz, CEO, VisibilityOne Corp. “They demonstrate and validate VisibilityOne's ongoing ability to develop leading-edge technologies for UC&C."